Also known as the Hollywood Peel, the Carbon Spectra is essentially four peels in one session, helping to refresh and revitalise the complexion with minimal downtime! The procedure takes about 45 minutes. You’ll see both immediate and long-term results, and it can help to eliminate pigment changes, fine lines, and acne scars. We will start by adding a carbon solution to your skin. Once applied, it looks a bit like you’re wearing a mud mask. From there, we will begin applying laser energy to your skin using a laser handpiece. You might hear a soft snapping sound or feel a light tingling. The laser treatment itself is fairly gentle, so we’ll need to make three passes over your skin to get the best possible results. As the laser passes over your skin, the carbon on the surface will absorb the heat and pass it to your skin below. This results in the top layer of your skin being exfoliated. The laser energy works to break up any pigment, which is carried away by your body. It also helps to stimulate the buildup of collagen, which can help you minimise those fine lines. If you’re looking for quick rejuvenation that helps you go from our offices to the red carpet, this is the way to go! Book your session now. This peel is most effective for dealing with a number of skin problems including acne, Melasma, and enlarged pores. It has the power to improve skin tone, texture, and elasticity. It can even reverse the sun damage you may suffer with, as well as scars from past acne, troublesome age spots, or any pigment problems you aren’t happy with, like freckles and blotches. Acne affects 85% of all teenagers and over 30% of adults. Now Spectra Laser Peel offers a reliable, lasting solution to all types of acne. The benefits include reduction of all types of acne. The procedure controls sebum production, shrinks large pores, reduces redness from inflamed acne. It is safe for inflamed acne reducing reoccurrence and inflammation. Sebum levels, acne pimples and general skin condition will improve after the first session and two or three treatments spaced two to three weeks apart should achieve quite dramatic results. Spectra Laser Peel is the latest non-ablative skin rejuvenation procedure providing the most effective solution for enlarged pores. This laser treatment can also brighten or smooth out your skin tone and reduce fine lines. In most cases, 3 – 5 treatments will be required for optimum and long-lasting results. It is recommended that treatments are repeated every 2 – 3 weeks for pore size reduction. To maintain the clinical results, treatments should be performed twice a year. 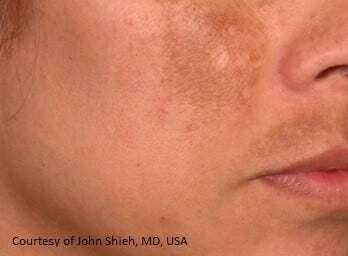 Melasma is the medical term for patches of brown or tan spots common among women, which appear symmetrically on the cheeks and around the eyes. This unique two-part procedure involves the application of a carbon mask with laser energy to reduce visible pigmentation, at the same time improving the skin texture and reducing pore size and fine lines. 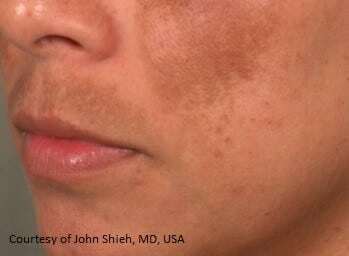 Melasma laser treatment is a gradual process that requires 6-8 sessions to work effectively, therefore it is important to wait the proper amount of time for results. You will meet with one of our practitioners for an in depth discussion. Your skin will be examined and you will be given an opportunity to ask questions and to discuss your medical history. The laser peel begins with application of a carbon solution onto the skin. This liquid “tricks” the laser into thinking it is attacking pigment. As the laser is passed three times over the skin, the carbon absorbs heat, passing it on to the underlying skin. This result-driven treatment will improve the appearance of your skin in just one session. It is a gentle, yet effectively exfoliating the skin treatment without the downtown of a harsh peel. When your treatment is complete you will be advised to avoid direct sun exposure for at least 24 hours. You skin may appear red for a short amount of time following treatment, however there is no downtime. Spectra Laser Peel is a safe treatment that is performed on thousands of men and women each year. It is recommended that you consult your practitioner regarding any concerns that you may have. While laser treatments are considered to be long-lasting, they are not permanent. Patients can help maintain their new appearance by carefully following the post-care instructions and by avoiding prolonged sun exposure. You can speak to the clinic to discuss your requirements, but most people can benefit from this treatment. This includes men and women and different skin types. It is a good ‘pick-me-up’ treatment for the party season.